Directive 2004/49/EC aims to improve access to the market for rail transport services by defining common principles for the management, regulation and supervision of railway safety. Directive 2004/49/EC also provides for a framework to be put in place to ensure equal conditions for all entities in charge of maintenance for freight wagons through application of the same certification requirements across the Union. The purpose of the certification system is to provide a framework for the harmonisation of requirements and methods to assess the ability of entities in charge of maintenance across the Union. Without prejudice to the responsibility of railway undertakings and infrastructure managers for the safe operation of trains, the entity in charge of maintenance should ensure that the freight wagons for which it is in charge of maintenance are in a safe state of running by means of a system of maintenance. Taking into account the wide variety of design and maintenance methods, this system of maintenance should be a process-oriented system. Infrastructure managers need to use freight wagons to transport materials for construction or for infrastructure maintenance activities. When they operate freight wagons for this purpose, infrastructure managers do so in the capacity of a railway undertaking. The assessment of the infrastructure manager’s capacity to operate freight wagons for this purpose should be part of its assessment for a safety authorisation under Article 11 of Directive 2004/49/EC. Inspections and monitoring undertaken before the departure of a train or en route are generally performed by operational staff of the railway undertakings or infrastructure managers, following the process described in their safety management system in accordance with Article 4(3) of Directive 2004/49/EC. The railway undertakings or the infrastructure managers should ensure, through their safety management system, the control of all risks related to their activity, including the use of contractors. To this end, a railway undertaking should rely on contractual arrangements involving entities in charge of maintenance for all wagons it operates. This could be a contract between the railway undertaking and the entity in charge of maintenance or a chain of contracts involving other parties, such as the keeper. These contracts should be consistent with the procedures outlined by a railway undertaking or an infrastructure manager in its safety management system, including for the exchange of information. In accordance with Directive 2004/49/EC, a certificate for an entity in charge of maintenance (ECM certificate) is valid throughout the Union. Certificates issued by bodies in third countries appointed under equivalent criteria and meeting equivalent requirements to those contained in this Regulation should normally be accepted as being equivalent to the ECM certificates issued in the Union. 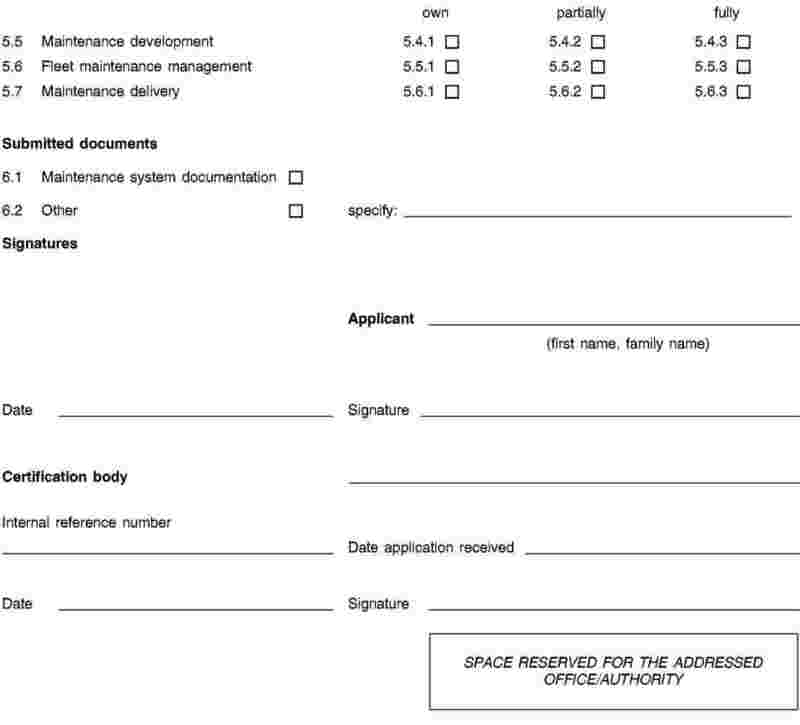 The assessment by a certification body of an application for an ECM certificate is an assessment of the applicant’s ability to manage maintenance activities and to deliver the operational functions of maintenance either by itself or through contracts with other bodies, such as maintenance workshops, charged with delivering these functions or parts of these functions. A system of accreditation should provide a tool for managing risks by assuring that accredited bodies are competent to carry out the work they undertake. Furthermore, accreditation is regarded as a means to secure national and international recognition of ECM certificates issued by accredited bodies. In order to have a system allowing certification bodies to perform checks on certified entities in charge of maintenance across the Union, it is important that all bodies able to award certificates to any entity in charge of maintenance (the ‘certification bodies’) should cooperate with each other in order to harmonise approaches to certification. Specific requirements for accreditation should be developed and approved in line with the provisions of Regulation (EC) No 765/2008 of the European Parliament and of the Council (2). To evaluate the certification process set out in this Regulation, it is important that the European Railway Agency (the Agency) oversees the development of the system of certification. To be able to perform this function, the Agency needs to collect information on the nature of the certification bodies active in this field and the number of certificates issued to entities in charge of maintenance. It is also important for the Agency to facilitate coordination of the certification bodies. Commission Regulation (EC) No 653/2007 of 13 June 2007 on the use of a common European format for safety certificates and application documents in accordance with Article 10 of Directive 2004/49/EC of the European Parliament and of the Council and on the validity of safety certificates delivered under Directive 2001/14/EC (3) provides the standard format for safety certificates. This format must be updated to include further information on entities in charge of maintenance. Regulation (EC) No 653/2007 should therefore be amended accordingly. Pending the full application of the certification system of the entity in charge of maintenance provided for in this Regulation, the validity of existing practices to certify entities in charge of maintenance and maintenance workshops should be recognised during a period of transition in order to ensure the uninterrupted provision of rail freight services, in particular at international level. During this period the national safety authorities should pay particular attention to the equivalence and the consistency of the different certification practices. 1. This Regulation establishes a system of certification of entities in charge of maintenance for freight wagons as referred to in Article 14a of Directive 2004/49/EC. 2. The purpose of the system of certification is to provide evidence that an entity in charge of maintenance has established its maintenance system and can meet requirements laid down in this Regulation to ensure the safe state of running of any freight wagon for which it is in charge of maintenance. 1. The system of certification shall apply to any entity in charge of maintenance for freight wagons to be used on the railway network within the Union. 2. Maintenance workshops or any organisation taking on a subset of the functions specified in Article 4 may apply the system of certification on a voluntary basis, based on the principles specified in Article 8 and Annex I. 3. References to an infrastructure manager in Articles 5, 7 and 12 shall be understood as relating to its operations with freight wagons for transporting materials for construction or for infrastructure maintenance activities. When it operates freight wagons for this purpose, an infrastructure manager shall be deemed to do so in the capacity of a railway undertaking. 1. For the purposes of this Regulation, the definitions laid down in Article 3 of Directive 2004/49/EC apply. ‘return to operation’ means the assurance, based on a release to service, given to the user, such as a railway undertaking or a keeper, by the entity in charge of maintenance that all appropriate maintenance works have been completed and the wagon, previously removed from operation, is in a condition to be used safely, possibly subject to temporary restrictions of use. the maintenance delivery function, which delivers the required technical maintenance of a freight wagon or parts of it, including the release to service documentation. 2. The entity in charge of maintenance shall ensure that the functions referred to in paragraph 1 comply with the requirements and assessment criteria set out in Annex III. 3. The entity in charge of maintenance shall carry out the management function itself, but may outsource the maintenance functions referred to in points (b) to (d) of paragraph 1, or parts of them, to other contracting parties subject to the provisions of Article 8. Where it resorts to outsourcing, the entity in charge of maintenance shall ensure that the principles set out in Annex I are applied. 4. Regardless of the outsourcing arrangements in place, the entity in charge of maintenance shall be responsible for the outcome of the maintenance activities it manages and shall establish a system to monitor performance of those activities. 1. Each railway undertaking or infrastructure manager shall ensure that the freight wagons it operates, before their departure, have a certified entity in charge of maintenance and that the use of the wagon corresponds to the scope of the certificate. 2. All parties involved in the maintenance process shall exchange relevant information about maintenance in accordance with the criteria listed in sections I.7 and I.8 of Annex III. 3. Following contractual arrangements, a railway undertaking may request information for operational purposes on the maintenance of a freight wagon. The entity in charge of the maintenance of the freight wagon shall respond to such requests either directly or through other contracting parties. 4. Following contractual arrangements, an entity in charge of maintenance may request information on the operation of a freight wagon. The railway undertaking or the infrastructure manager shall respond to such requests either directly or through other contracting parties. 5. All contracting parties shall exchange information on safety-related malfunctions, accidents, incidents, near-misses and other dangerous occurrences as well as on any possible restriction on the use of freight wagons. 6. The certificates of entities in charge of maintenance shall be accepted as proof of the ability of a railway undertaking or infrastructure manager to meet the requirements governing maintenance and the control of contractors and suppliers specified in Annex II, points B.1, B.2, B.3 and C.1, to Commission Regulation (EU) No 1158/2010 of 9 December 2010 on a common safety method for assessing conformity with the requirements for obtaining railways safety certificates (4) and Commission Regulation (EU) No 1169/2010 of 10 December 2010 on a common safety method for assessing conformity with the requirements for obtaining a railways safety authorisation (5), unless the national safety authority can demonstrate the existence of a substantial safety risk. 7. If a contracting party, in particular a railway undertaking, has a justified reason to believe that a particular entity in charge of maintenance does not comply with the requirements of Article 14a(3) of Directive 2004/49/EC or with the certification requirements of this Regulation, it shall promptly inform the certification body thereof. The certification body shall take appropriate action to check if the claim of non-compliance is justified and shall inform the parties involved (including the competent national safety authority if relevant) of the results of its investigation. 8. When there is a change of entity in charge of maintenance, the registration holder as indicated in Article 33(3) of Directive 2008/57/EC of the European Parliament and of the Council (6), shall inform in due time the registration entity, as defined in Article 4(1) of Commission Decision 2007/756/EC (7), so that the latter may update the national vehicle register. The former entity in charge of maintenance shall deliver the maintenance documentation to either the registration holder or the new entity in charge of maintenance. The former entity in charge of maintenance is relieved of its responsibilities when it is removed from the national vehicle register. If on the date of de-registration of the former entity in charge of maintenance any new entity has not acknowledged its acceptance of entity in charge of maintenance status, the registration of the vehicle is suspended. 1. ECM certificates shall be awarded by any competent certification body, chosen by the applicant entity in charge of maintenance. 2. Member States shall ensure that the certification bodies comply with the general criteria and principles set out in Annex II and with any subsequent sectoral accreditation schemes. 3. Member States shall take the measures necessary to ensure that decisions taken by the certification bodies are subject to judicial review. 4. In order to harmonise approaches to the assessment of applications, the certification bodies shall cooperate with each other both within the Member States and across the Union. 5. The Agency shall organise and facilitate cooperation between the certification bodies. 1. Certification shall be based on an assessment of the ability of the entity in charge of maintenance to meet the relevant requirements in Annex III and to apply them consistently. It shall include a system of surveillance to ensure continuing compliance with the applicable requirements after award of the ECM certificate. 2. 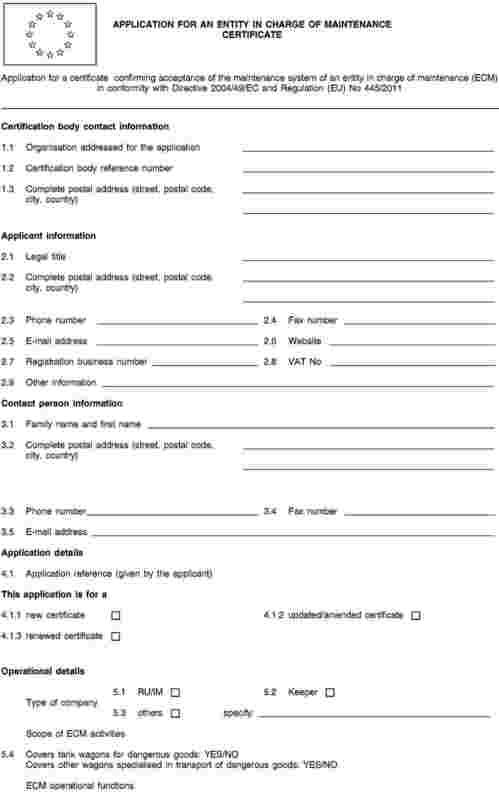 The entities in charge of maintenance shall apply for certification using the relevant form in Annex IV and providing documentary evidence of the procedures specified in Annex III. They shall promptly submit all supplementary information requested by the certification body. In assessing applications, certification bodies shall apply the requirements and assessment criteria set out in Annex III. 3. The certification body shall take a decision no later than 4 months after all the information required and any supplementary information requested has been submitted to it by the entity in charge of maintenance applying for the certificate. The certification body shall undertake the necessary assessment at the site or sites of the entity in charge of maintenance prior to the award of the certificate. 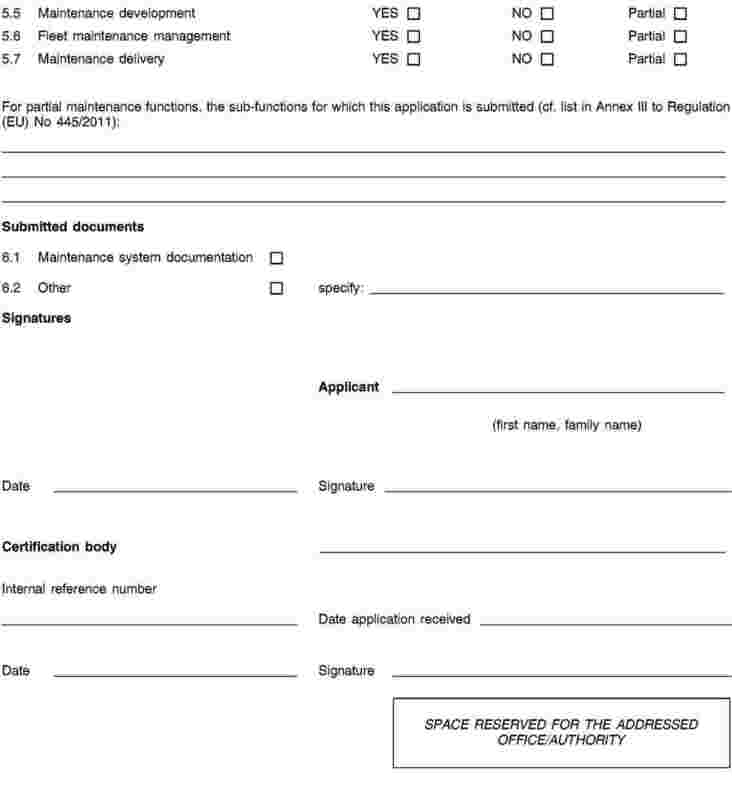 The decision on the award of the certificate shall be communicated to the entity in charge of maintenance using the relevant form in Annex V.
4. An ECM certificate shall be valid for a period up to 5 years. The holder of the certificate shall without delay inform the certification body of all significant changes in the circumstances applying at the time the original certificate was awarded to allow the certification body to decide whether to amend, renew or revoke it. 5. The certification body shall set out in detail the reasons on which each of its decisions is based. The certification body shall notify its decision and the reasons to the entity in charge of maintenance, together with an indication of the process, time limit for appeal and the contact details of the appeal body. 6. The certification body shall conduct surveillance at least once a year at selected sites, geographically and functionally representative of all the activities of those entities in charge of maintenance it has certified, to verify that the entities still satisfy the criteria set out in Annex III. 7. 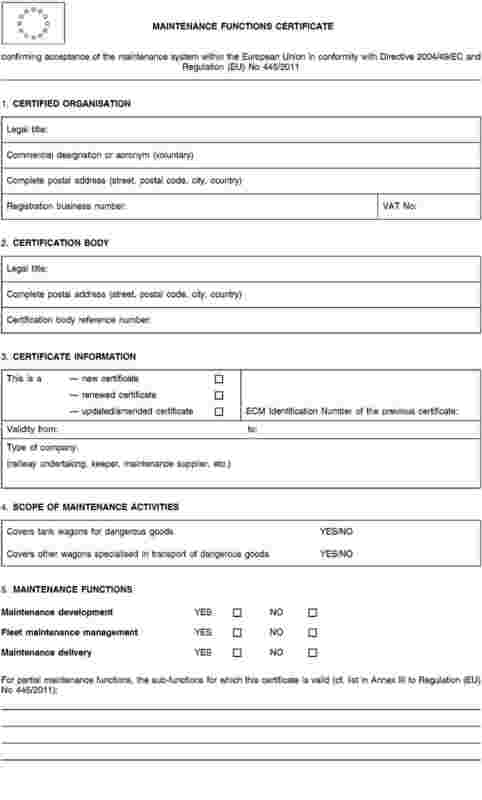 If the certification body finds that an entity in charge of maintenance no longer satisfies the requirements on the basis of which it issued the ECM certificate, it shall agree an improvement plan with the entity in charge of maintenance, or limit the scope of application of the certificate, or suspend the certificate, depending on the degree of non-compliance. 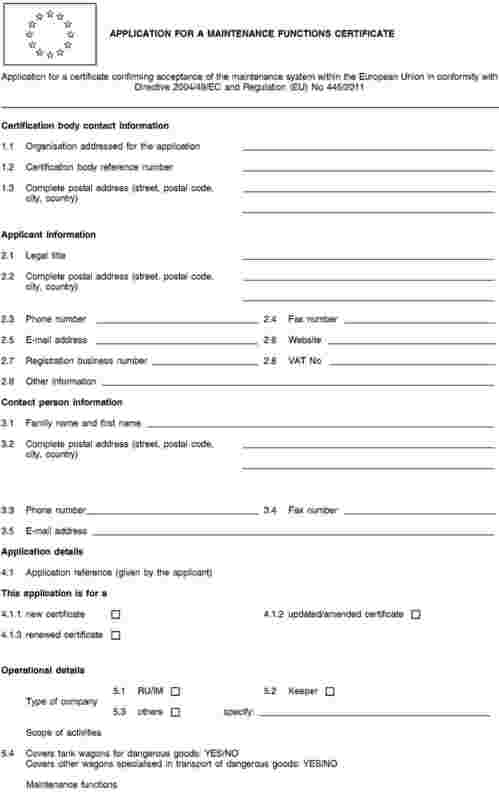 In the event of continuous non-compliance with the certification requirements or any improvement plan, the certification body shall limit the scope of or revoke the ECM certificate, giving reasons for its decision, together with an indication of the process and time limit for appeal and the contact details of the appeal body. where the freight wagons are maintained by parties other than the applicant, the applicant shall ensure, through its safety management system, the control of all risks related to its activity, including the use of such wagons, whereby, in particular, the provisions of Article 5 of this Regulation shall apply. Certification bodies and national safety authorities shall conduct an active exchange of views in all circumstances in order to avoid any duplication of assessment. 1. Where the entity in charge of maintenance decides to outsource one or more of the functions referred to in Article 4(1)(b), (c) and (d), or parts of them, voluntary certification of the contractor under the certification system of this Regulation shall create a presumption of conformity of the entity in charge of maintenance with the relevant requirements set out in Annex III, as far as these requirements are covered by the voluntary certification of the contractor. In the absence of such certification, the entity in charge of maintenance shall demonstrate to the certification body how it complies with all the requirements set out in Annex III with regard to the functions it decides to outsource. 2. Certification in respect of outsourced maintenance functions, or parts of them, shall be issued by the certification bodies, following the same procedures in Articles 6, 7, and 10(3), adapted to the specific case of the applicant. They shall be valid throughout the Union. In assessing applications for certificates in respect of outsourced maintenance functions, or parts of them, certification bodies shall follow the principles set out in Annex I. If a national safety authority has a justified reason to believe that a particular entity in charge of maintenance does not comply with the requirements of Article 14a(3) of Directive 2004/49/EC or with the certification requirements of this Regulation, it shall immediately take the necessary decision and inform the Commission, the Agency, other competent authorities, the certification body and other interested parties of its decision. 1. By no later than 30 November 2011, Member States shall inform the Commission whether the certification bodies are accredited bodies, recognised bodies or national safety authorities. They shall also notify any change in this situation to the Commission within 1 month of the change. 2. By no later than 31 May 2012, Member States shall notify the Agency of the certification bodies recognised. The accreditation bodies as defined in Regulation (EC) No 765/2008 shall inform the Agency of the certification bodies accredited. Any change shall also be notified to the Agency within 1 month of the change. 3. Certification bodies shall notify the Agency of all issued, amended, renewed or revoked ECM certificates or certificates for specific functions according to Article 4(1), within 1 week from its decision, using the forms in Annex V.
4. The Agency shall keep a record of all information notified under paragraphs 2 and 3 and shall make it publicly available. Annex I to Regulation (EC) No 653/2007 is replaced by the text set out in Annex VI to this Regulation. 1. The following transitional provisions shall apply without prejudice to Article 9. 2. Starting from 31 May 2012, any ECM certificate shall be issued in accordance with this Regulation to entities in charge of maintenance for freight wagons, without prejudice to Article 14a(8) of Directive 2004/49/EC. 3. 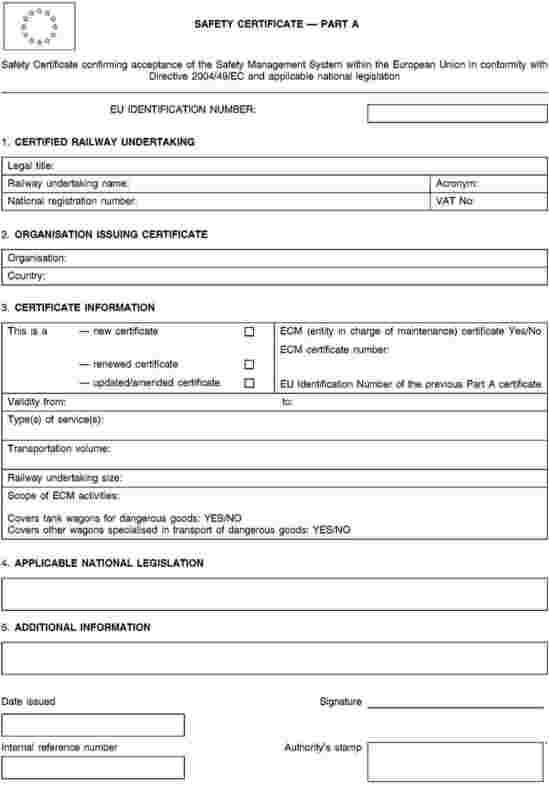 Certificates issued by a certification body by no later than 31 May 2012 on the basis of principles and criteria equivalent to those of the Memorandum of Understanding establishing the basic principles of a common system of certification of entities in charge of maintenance for freight wagons, signed by Member States on 14 May 2009, shall be recognised as being equivalent to ECM certificates issued under this Regulation for their original validity period until at the latest 31 May 2015. 4. Certificates issued by a certification body to entities in charge of maintenance by no later than 31 May 2012 on the basis of national laws existing before the entry into force of this Regulation and equivalent to this Regulation, in particular Articles 6 and 7 and Annexes I and III, shall be recognised as being equivalent to ECM certificates issued under this Regulation for their original period of validity until at the latest 31 May 2015. 5. Certificates issued to maintenance workshops by no later than 31 May 2014 on the basis of national laws existing before the entry into force of this Regulation and equivalent to this Regulation shall be recognised as being equivalent to certificates for maintenance workshops taking on the maintenance delivery function issued under this Regulation for their original period of validity until at the latest 31 May 2017. 6. Without prejudice to paragraphs 3 to 5, entities in charge of maintenance for freight wagons registered in the national vehicle register by no later than 31 May 2012 shall be certified in accordance with this Regulation by no later than 31 May 2013. 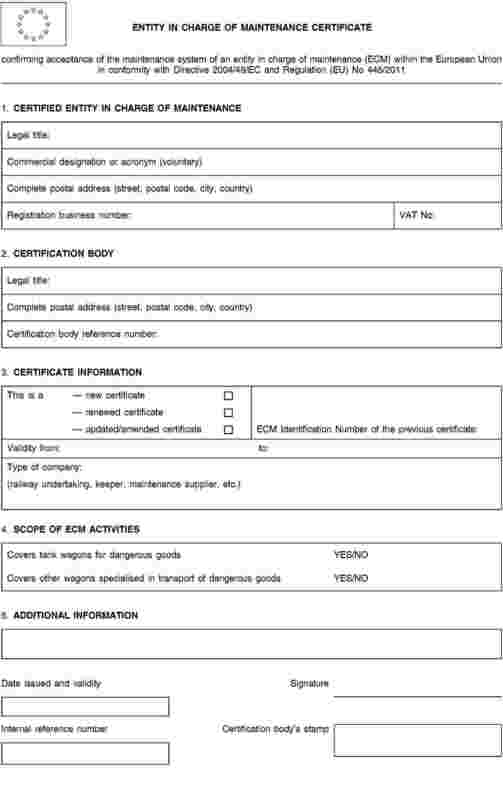 During this period, self declarations of conformity of entities in charge of maintenance to the relevant requirements of the present Regulation or of the Memorandum of Understanding establishing the basic principles of a common system of certification of entities in charge of maintenance for freight wagons, signed by Member States on 14 May 2009 shall be recognised as being equivalent to ECM certificates issued under this Regulation. 7. Railway undertakings and infrastructure managers which are already certified in accordance with Articles 10 and 11 of Directive 2004/49/EC by no later than 31 May 2012 need not apply for an ECM certificate for the original period of validity of their certificates for maintaining the wagons they are responsible for as entity in charge of maintenance. This Regulation shall enter into force on the 20th day following the date of its publication in the Official Journal of the European Union. Done at Brussels, 10 May 2011. (2) OJ L 218, 13.8.2008, p. 30. (3) OJ L 153, 14.6.2007, p. 9. (4) OJ L 326, 10.12.2010, p. 11. (5) OJ L 327, 11.12.2010, p. 13. (6) OJ L 191, 18.7.2008, p. 1. (7) OJ L 305, 23.11.2007, p. 30.
requirements and assessment criteria describing the specific maintenance function or functions. the processes describing the maintenance delivery function. The certification body must document its organisational structure, showing the duties, responsibilities and authorities of management and other certification staff and any committees. Where the certification body is a defined part of a legal entity, the structure must include the line of authority and the relationship to other parts within the same legal entity. The certification body must be organisationally and functionally independent in its decision-making from railway undertakings, infrastructure managers, keepers, manufacturers and entities in charge of maintenance and shall not provide similar services. The independence of the staff responsible for the certification checks must be guaranteed. No official must be remunerated on the basis of either the number of checks performed or the results of those checks. The certification body and the staff deployed must have the required professional competence, in particular regarding the organisation of the maintenance of freight wagons and the appropriate maintenance system. knowledge of the applicable requirements of the legislation. sufficient experience in freight wagon maintenance or at least in maintenance in equivalent industrial sectors. The certification body’s decisions must be based on objective evidence of conformity or non-conformity obtained by the certification body, and must not be influenced by other interests or by other parties. The certification body is not responsible for ensuring ongoing conformity with the requirements for certification. The certification body has the responsibility to assess sufficient objective evidence upon which to base a certification decision. A certification body needs to provide public access to, or disclosure of, appropriate and timely information about its audit process and certification process. It also needs to provide information about the certification status (including the granting, extension, maintenance, renewal, suspension, reduction in scope, or withdrawal of certification) of any organisation, in order to develop confidence in the integrity and credibility of certification. Openness is a principle of access to, or disclosure of, appropriate information. To gain the privileged access to information needed to assess conformity with the requirements for certification adequately, a certification body must keep confidential any commercial information about a client. The certification body must establish a procedure to handle complaints about decisions and other certification-related activities. The certification body must be able to demonstrate that it has evaluated the risks arising from its certification activities and that it has adequate arrangements (including insurance or reserves) to cover liabilities arising from its operations in each field of its activities and the geographic areas in which it operates. ensuring that staff and staff representatives are adequately represented and consulted in defining, developing, monitoring and reviewing the safety aspects of all related processes that may involve staff. developing and putting in place risk control measures. The organisation must have procedures and arrangements in place to recognise the need and commitment to collaborate with keepers, railway undertakings, infrastructure managers, or other interested parties. The organisation must have risk assessment procedures to manage changes in equipment, procedures, organisation, staffing or interfaces, and to apply Commission Regulation (EC) No 352/2009 (1). When assessing risk, an organisation must have procedures to take into account the need to determine, provide and sustain an appropriate working environment which conforms to Union and national legislation, in particular Council Directive 89/391/EEC (2). information on experience, malfunctions, defects and repairs arising from day-to-day operation and maintenance. The organisation must have procedures to ensure that accidents, incidents, near-misses and other dangerous occurrences are reported, logged, investigated and analysed. verify the effectiveness of previous measures/actions. relevant reports/information from railway undertakings/infrastructure managers and keepers or other relevant sources are considered and taken into account. The organisation must have procedures to allocate responsibilities for all relevant processes throughout the organisation. The organisation must have procedures to clearly define safety-related areas of responsibility and the distribution of responsibilities to specific functions associated with them as well as their interfaces. These include the procedures indicated above between the organisation and the keepers and, where appropriate, railway undertakings and infrastructure managers. The organisation must have procedures to ensure that staff with delegated responsibilities within the organisation have the authority, competence and appropriate resources to perform their functions. Responsibility and competence should be coherent and compatible with the given role, and delegation must be in writing. The organisation must have procedures to ensure the coordination of activities related to relevant processes across the organisation. The organisation must have procedures to hold those with a role in the management of safety accountable for their performance. the allocation of staff with the appropriate competence to relevant tasks. special measures in the case of accidents/incidents or long absences from work, as required. The organisation must have procedures to define reporting channels to ensure that, within the entity itself and in its dealings with other actors, including infrastructure managers, railways undertakings and keepers, information on all relevant processes is duly exchanged and submitted to the person having the right role both within its own organisation and in other organisations, in a prompt and clear way. for making available reliable and up-to-date information. easily accessible to staff, with copies provided to them where required. all relevant information/data needed to submit the annual maintenance report to the certification body and to the relevant customers (including keepers), whereby this report must also be made available upon request to national safety authorities. The organisation must have adequate procedures in place to ensure that all relevant processes are duly documented. receive, collect and archive all relevant documentation. The organisation must have procedures in place to ensure that safety related products and services are identified. contractors, subcontractors and suppliers have a maintenance and management system that is adequate and documented. The organisation must have a procedure to define the requirements that such contractors and suppliers have to meet. The organisation must have procedures to monitor the awareness of suppliers and/or contractors of risks they entail to the organisation’s operations. When the maintenance/management system of a contractor or supplier is certified, the monitoring process described in point 3 may be limited to the results of the contracted operational processes referred to in point 3.1(b). the traceability of safety-related documents. 1. The organisation must have a procedure to identify and manage all maintenance activities affecting safety and safety-critical components. managing the configuration of all technical changes affecting the system integrity of the vehicle. 3. The organisation must have a procedure to design and to support the implementation of maintenance facilities, equipment and tools specifically developed and required for maintenance delivery. The organisation must have a procedure to check that these facilities, equipment and tools are used, stored and maintained according to their maintenance schedule and in conformity with their maintenance requirements. ensure that the implementation of the first maintenance file is done correctly. ensure that the implementation of changes is done correctly. joining techniques (including welding and bonding), brake systems, wheel sets and draw gear, non-destructive testing techniques and maintenance activities on specific components of freight wagons for the transport of dangerous goods such as tanks and valves. technical information to be provided to support keepers, railway undertakings and infrastructure managers. 1. The organisation must have a procedure to check the competence, availability and capability of the entity responsible for maintenance delivery before placing maintenance orders. This requires that the maintenance workshops are duly qualified to decide upon the requirements for technical competences in the maintenance delivery function. 2. The organisation must have a procedure for the composition of the work package and for the issue and release of the maintenance order. 3. The organisation must have a procedure to send freight wagons for maintenance in due time. 4. The organisation must have a procedure to manage the removal of freight wagons from operation for maintenance or when defects have been identified. 5. The organisation must have a procedure to define the necessary control measures applied to the maintenance delivered and the release to service of the freight wagons. 6. The organisation must have a procedure to issue a notice to return to operation, taking into account the release to service documentation. 7. When the competence management (CM) process is applied to the fleet maintenance management function, at least the return to operation must be taken into account. all additional relevant information related to safety according to the risk assessment performed by the organisation. 9. When the information process is applied to the fleet maintenance management function, at least the return to operation, including restrictions on use relevant to users (railway undertakings and infrastructure managers), needs to be communicated to interested parties. return to operation, including restrictions on use relevant to railway undertakings and infrastructure managers. ensure that all relevant maintenance specifications, as defined in applicable regulations and specified standards contained in the maintenance orders, are available to all involved staff (e.g. they are contained in internal working instructions). all components and materials, including those provided by the customer, comply with relevant national and international rules as well as with the requirements of relevant maintenance orders. ergonomics and health protection, also including the interfaces between users and information technology systems or diagnostic equipment. 5. The organisation must have procedures to ensure that all facilities, equipment and tools are correctly used, calibrated, preserved and maintained in accordance with documented procedures. 6. The organisation must have procedures to check that the performed maintenance tasks are in accordance with the maintenance orders and to issue the notice to release to service that includes eventual restrictions of use. 7. When the risk assessment process (in particular point 2.4 of section I) is applied to the maintenance delivery function, the working environment includes not only the workshops where maintenance is done but also the tracks outside the workshop buildings and all places where maintenance activities are performed. other identified specialist areas affecting safety. the validity of the previous measuring results when a measuring instrument is found not to conform to requirements. (1) OJ L 108, 29.4.2009, p. 4. (2) OJ L 183, 29.6.1989, p. 1.